1 Have You Checked & Priced Your International Flights? We don’t book international flights into Spain or Portugal but if you are travelling long-distance – one thing we will ask is whether you know where you are flying into and whether you have priced the flights. It might seem impertinent but we know that the flights are a big part of any travel budget and their cost can have a significant impact on a client’s budget for their land arrangements. If you want to learn what routes you can take to get here and see some sample pricing from your home city, Skyscanner is very handy. 2 Where Will You Fly Into & Out of Spain? Spain is bigger than most people realise so whenever possible we recommend flying into one of the big cities such as Madrid and flying out of one of the others such as Barcelona. Not only can it save you time but it could save you money too as you don’t need to backtrack. Whatever route you take, we can work with – but we need to know the arrival and departure points from the beginning as it will shape the itinerary we plan for you. 3 How Many Nights Do You Plan to Stay in Spain? This is very important as it will allow us to judge how many places realistically you can visit on your trip while still keeping the pace relaxed. For example, for those wishing to stay in 3 to 5 different locations, a trip duration of between 7 to 10 nights would generally be recommended. However, this may vary if the locations chosen are very far apart or tricky to get to. We can advise you of this once we know the maximum number of days you have at your disposal. 4 How Soon Are You Travelling? This may seem obvious but we need to know your expected arrival date. It becomes hugely important if you are travelling in high season (generally April to September) to the more popular locations. Normally we like everything to be booked and confirmed at least 8 weeks before a client travels. This allows us time to make and confirm all your arrangements, process payments, prepare & send you a personalised documentation pack including road and city maps (with all your hotels and meeting points marked), itineraries, tourist brochures & information, restaurant suggestions, etc. This way, you have plenty of time to acquaint yourself with the locations you’ll be visiting and can ask us any final questions or seek clarification well before you pack your bags. So, if you contact us and you are plan to travel within 8 weeks, we literally have to drop everything else and deal with your request. We take each and every request very seriously and will be investing several hours in your Custom Proposal that is ready to book. When time is tight, we may even take steps to provisionally hold hotel rooms for you so as not to lose the space or a good offer. So for this we’d kindly ask that you have your exact dates, arrival and departure points and a list of any “must-haves” and places you wish to see. It will mean that we can deal more speedily and efficiently with your request. 5 Where Do You Want to Go in Spain? As we’ve said already, Spain is a big country made up of 17 very different regions so it’s important for us to have an idea of where you would like to visit in Spain & Portugal. We love guiding clients on what to see in Spain and you’ll find these links below useful when getting to grips with what the country has to offer. Firstly, check out our Introduction to Spain for an overview of the regions (key sights, history, geography, cuisine, festivals, and more). You could also review the top 10 “must see” attractions in Spain plus some of Spain’s hidden gems. And we highly recommend that you visit and subscribe to this Totally Spain blog where we provide travel ideas and guides to places worth visiting in Spain and Portugal. If you’re not sure where you want to go, perhaps you can tell us what you want to see or experience? 6 What Do You Want to Experience in Spain? The same goes for food. Do you want authentic paella? Would you like to try the best tapas in Madrid or pintxos in San Sebastian? Maybe you’d like to experience some of the finest Michelin starred restaurants or the soon-to-be Michelin stars? Perhaps you’d like to learn how to cook Spanish or Portuguese food? All this we need to know. Tell us about your hobbies and interests and also your occupation. If music is your life and you love the Spanish guitar, we’ll find a concert or event that will astonish you. If you spend your weekends restoring classic cars, we’ll include a trip to a classic car museum with lots of vintage Spanish motors you might not be familiar with. If you work as a sommelier, we’ll use that knowledge if planning meals or winery visits for you. If civil engineering is your thing, we’ve, for example, some pretty special bridges you might want to check out. If you’ve just finished hiking the Pacific Crest Trail, we’ll find a few days hiking that dovetails with your trip perfectly. Let us know what you like to do at home and what you like to do when on holidays. (You can ever tell us where you enjoyed in a different country – perhaps it was the food markets in Italy, the white washed villages in Crete or the Mayan ruins in Mexico which helps us understand the type of trip you like). 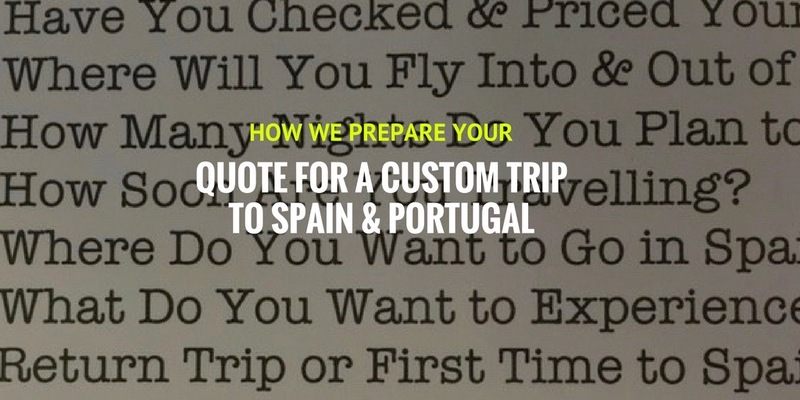 And of course, tell us what you’ve been dreaming about doing when in Spain or Portugal. Fulfilling dreams is part of our remit! 7 Return Trip or First Time to Spain? First-timers to Spain need completely different itineraries to second and third-timers. If you have been already or some of your travelling party have been to Spain – let us know and tell us where you’ve been. It’s the only way we can make sure not to duplicate elements in the itinerary. So if you have been to the Prado, tell us. Madrid is home to lots more amazing museums. If there were places you visited but didn’t have time to explore properly, we can make sure to plan the visit differently, perhaps by arranging a local expert guide to take you around this time. 8 Do You Plan to Move Around Much? Some of our clients love changing city every two days whereas others like to stay three nights per hotel or even longer. Have you considered how long you want to stay at each location? Once we know the pace you want to take (or need to take based on the entire travelling party) we can design the perfect itinerary – either busy or relaxed or a combination of both. 9 Are you A City Person or Do You Want to Avoid the Hustle & Bustle? Do you want to include any small villages and towns in your itinerary? This can not only influence the types of places you stay but also how you travel around. For example if you want to avoid the big cities, then you may wish to take a self-drive tour of a few regions staying at some charming historic hotels. For example, Cantabria, Asturias and Galicia are terrific for special places to stay and for getting off the beaten path. If you only want to see the big cities, you may be better off staying in downtown locations and perhaps taking high-speed trains from city to city as parking is sometimes challenging and costly in urban areas. 10 On the Coast or Inland? Is being on the beach or near the coast a key part of this trip? Spain has an amazing coastline and many clients like to spend some of their time here enjoying the fishing villages and sandy beaches. But others, that perhaps already live on the coast, prefer to explore inland Spain. If you are travelling off peak, you can combine a combination of both. Those travelling during peak season (July & August) when the Spanish take their holidays on the coast, may find better value for money by staying inland at places such as Seville, Granada & Madrid. We work with lots of great properties with amazing rooftop pools so you’ll still be able to relax and cool off in the evening. And regions such as Extremadura have some wonderful natural areas like the Orellana Reservoir where you can bathe safely inland. If you want to spend some time on the coast, please let us know how many nights you’d like to do so. 11 Planes, Trains & Automobiles – Any Preferences? We take care of all the travel logistics and will book your car-hire, high speed train tickets, airport transfers, buses and private drivers for you. Knowing your preferences in advance allows us to help you make the most of your trip. For example, if you prefer to fly than take a high-speed train or vice versa, we need to know. If car hire is to be an element of the trip, we need to know whether you can drive with a manual gear stick or if you need an automatic. We’ll also need to know what distances you are comfortable driving so we can devise your itinerary. If you know you don’t want anything longer than 3 hours in one go, we’ll ensure the longer stretches are done by high speed trains or domestic flights. In Spain, it’s easy to pick up the rental car in one location and drop it back at a different one, often at no extra cost. If you don’t wish to drive at all, we can include top-class high-speed trains, domestic flight connections (that are inexpensive) and our network of private drivers and chauffeurs. Whatever the mode of transport, we’ll come up with some really creative itineraries – as you can see here. 12 What Do You Expect from Your Hotels in Spain? Big, small, historical, modern, traditional in style or more contemporary? What style suits you and your travelling party? And the all important question – what is your hotel budget per night? Are you accustomed to staying in 5-star hotels with all the bells and whistles? Or do you attach less importance to the hotel itself and will a 3 or 4-star is perfect for you? As you can imagine, we work with a huge number of hotels in every category and location. It can be hard for us to read between the lines so if you can tell us straight away what you need and what your budget is, we can focus on just that segment. We always respect a client’s budget for accommodation and will do everything in our power to get you the best property at the best price for your dates you need. As you know, the price for a hotel is not just linked to the number of stars. It varies depending on location, style, service, availability, etc. Historical properties are normally more expensive, even if they have fewer stars, because they attract more interest. This is why having an idea of the budget, the number of stars and the preferred type of property is very helpful. Bear in mind that you’ll need to tell us if there are any special services that the hotels must have. This can include special dietary requirements, concierge, porterage, pool, gym, entertainment and any other facilities you think you must have on-site. Have a look at our blogpost on hotel rooms in Spain to get a sense of what to expect here as standard. Any information that you can give us – to avoid us shooting in the dark and offering accommodation that won’t be to the standard you are accustomed – will make all the difference to the final proposal presented. 13 What Special Extras Can We Factor In For You? If you know exactly what your daily budget is before you get in touch, please tell us, so we can then include all the special extra arrangements such as private tour guides, pre-booked tickets to popular museums and monuments, private transfers, and other expenses that will meet your budget. If your budget is limited, we may not, for example, include private guides but instead, group city tours which cost less. If you have more flexibility in terms of spending and are interested, we can suggest the locations where hiring a private guide really makes sense. We can also advise you on suitable daytrips from each location that can be taken as part of a bigger group or independently. And knowing what your budget is, we know whether to include cooking classes, private tapas tours, winery visits, unique dining experiences and gastronomy tours throughout your stay. If you’re not sure about including some of these add-ons, please read our post on Why We Recommend Gastronomy Tours. 14 How Much Does a Custom Trip to Spain Cost Per Day? Well, that’s a lot of questions but we have one more. This time, it’s the question we are asked by potential clients. It’s a tricky one to answer because each trip is unique. It’s hard to even give guidelines for the itineraries we produce but we would suggest that you’d need to budget for about EURO 220+ per person per day if you stay at modern 3-star and 4-star hotels. That increases to EURO 280+ per person per day for 3-star and 4-star historical hotels. And for 5-star hotels, the range is from EURO 320 – 900 or more per person per day. Remember that daily suggested rate doesn’t include your international flight. It would generally include hotel accommodation, airport transfers, transportation within Spain, guided tours & activities (either private or with a group), unique experiences, trip planning, very complete documentation and maps, and support from us during your trip. If you don’t have that budget but can answer all of the above questions and know your exact dates, we can try to use our know-how to find you something within your price range – as long as you are flexible about the itinerary, accommodation and services requested. Don’t worry – we only work with quality providers, and only place clients in locations that we have inspected personally and have used for years. We’d rather not take your booking than locate you in a place we cannot endorse. To get a sense of the types of itineraries we devise (each of which is modified to suit client’s dates, preferences, budget, etc.) check out Totally Spain’s Tours and Totally Spain’s Travel Offers. If you’ve read this far THANK YOU! We hope we haven’t come across as offputting – it certainly isn’t our intention. At Totally Spain we love what we do and want all our clients to have the trip of a lifetime. We’ve been organising custom trips for English speaking clients to both Spain & Portugal since the year 2000 and it’s become so much more than our workplace. It’s our way of life. Being based here in Spain, we are here on the ground for our clients should they need us. The best compliment we can be paid is when a client is truly satisfied with the trip we organised for them. We hope this post has helped you understand why we ask the questions we ask. Now, please go ahead and SEND US A REQUEST FOR A CUSTOM TRIP PROPOSAL! Want to know more about Totally Spain before sending the request? Click here to see a short video explaining our services. Have a look at our FAQs especially the section on fees. And read our previous blogpost on how to plan the perfect itinerary with the help of a Spain specialist. And check out our Popular Posts and Insiders Guides also for great tips on travelling here. Posted in The Travel Industry, Totally Spain, Useful Information.